I sat with Theresa1 the other day at a local coffee shop and watched the stress ooze from her pores. At the tail end of a spectacular four year academic sprint through High School, she was completely and utterly convinced that she was not going to get into Princeton. Her bone fides? A four page resume which included a perfect SAT score, a top of the class GPA, incredible AP tests , an amazing essay, and national, regional, and local STEM awards, and varsity letters. You would think that her college counselor would tell her that she had an excellent chance. I did not. I told her the truth. Theresa has about 7.28% chance of attaining Princeton admittance, if we look at last year’s reports. That is 7 out of 100, or .07 for those of you with math brains. Last year, the average admissions chance for all schools was 65.5%; that means 65 out of 100, or .655. Theresa, like so many other seriously high achievers, has a very small chance of getting into an Ivy League School. Theresa maxes out her chances at 7.28%. She has the same chance as all others in the pool of Princeton applicants. I know what you are thinking: What else could she have done? Why aren’t the odds higher? Can I adopt Theresa? Theresa could not have done anything else. She achieved and performed at the highest level. Her margin for improvement was infinitesimal. She did everything right and nothing wrong. She controlled all that she could control. So why aren’t the odds higher? 1. There is a certain mystique, panache, cachet, that goes with Ivy League educations. Additionally, there is return on investment. Ivy grads do amazing things. Granted, all college graduates have that potential, but the amount of opportunity which exists throughout an Ivy League education, and as an alumnus, is staggering. The return on investment is astoundingly high, and therefore it is an education which is sought out- not only by those like Theresa, but those who have achieved on a lesser plain. I know of not one student if offered admission to an Ivy League who would turn it down without serious and prolonged consideration. In business terms, demand (number of applicants) is high, supply (enrollment space) is low. 2. Admissions officers know that part of keeping their rank and reputation is the number of applications they get, as well as the number of accepted applicants who choose to attend. The Ivy League gets to be picky. But that does not mean that they do not encourage applicants from across the academic spectrum; they get an enormous number of applicants who have no business applying Ivy. In some cases, college admissions offices encourage those who have no chance to apply anyway. Increasing that number of applicants makes them more selective. Keeping that number of applicants over a long period of time keeps them at the top of the pyramid. Padding the applicant pool with interested but not well qualified students happens. (I am not suggesting that there is a business plan in all admissions to do this outright, but it happens insidiously through admissions officers who are unwilling to tell students to look elsewhere.) Admissions offices are supposed to represent the college in the most positive light. It is near impossible to do that while telling a 17 year old that they shouldn’t waste their application fees. It’s not just about having the 4.0. It never has been. Admissions, on a whole have never been an academic performance meritocracy; this is never clearer than at the highest echelons of admissions. Ethnicity, Economics, Geography, Future Plans, and so many other variables come into play. Colleges manipulate their incoming class to reflect the world around them as they see it, or would like to see it. They build their community individual by individual. It is not about just grades or awards, it’s about umami3, and there is no way to discover the certain umami for which a school looks for from year to year. So how do we make our students understand that unless they fit that defining characteristic for which a school is looking this year, their chances are smaller? Through managing their and their parents’ expectations. We do this by picking an assortment of colleges up and down the admissions spectrum (reaches, possibles, and likelys), reminding our students to do their best within the parameters of the application itself and in school in general, and by speaking to them about rejection. 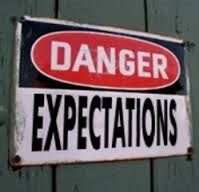 Somewhere on Pinterest, there is a quote, dubiously attributed to Shakespeare, which rings true in this situation, " expectation is the root of all heartache." At some point during the counseling process I tell the students that they WILL be denied admission to a college. It’s the skinned knee of college admissions: it’s almost a certainty you will experience it, it’s not going to kill you, and it hurts like hell. If they are applying to an Ivy League school the chances are great that they will be denied, about a 92.7% chance, in fact, looking at Princeton. Preparing for rejection is an important part of the application process. Colleges have different tastes. Some like Brussels sprouts, some don’t. Some like strawberries, some don’t. Some like steak, while others prefer chicken. Your application is a taste of who you are… and sometimes, they just take a “no thank you bite.” It is not that you are not delicious and wonderful; you’re just not for them. And as much as you would like to think it is, it’s not personal either. It’s not that the college doesn’t like you; it’s just that a student like you doesn’t fit into their recipe for their community. For Parents, this is a discussion you should have with your students. Manage their expectations. Know that denial is real and that it will happen. Be prepared: give them a day and then move on. Remind them to keep their pain and disappointment off social media. Remind them that they will be attending a great school. Remind them that sometimes getting denied makes the right school for them stand out more. Remind them that no one wants to attend a school that has decided you are not to their taste. Back to Theresa: Theresa will wait with impatience for her decision from Princeton. Probability suggests that she will be declined, like most others applying. (Not that she doesn’t deserve admittance. She does.) She is taking a risk with this school, a big risk. But she knows the chances. She is managing her expectations. She has other wonderful schools where she will be admitted without a doubt. She will excel at any school fortunate enough to have her. Theresa will be hugely successful in the admissions arena, regardless of what Princeton decides. Theresa has the umami for which many schools, including the Ivys, are looking. There is potential that Princeton will see the fabulous, intelligent, funny, smart, beautiful, kind, young woman I see and dig in. 2. Ivy League Schools: Yale, University of Pennsylvania, Princeton, Harvard, Dartmouth, Cornell, Columbia, Brown. The Ivy League was coined in 1935 by a sportswriter who referred to the athletic conference to which all the schools belonged. There are no other colleges in the Ivy League. Regardless of admissions selectivity, the term Ivy League can only rightly be used by these 8 schools. 3. Umami is a Japanese term used in cooking as the hard to describe 5th flavor center on the tongue, providing deliciousness or yumminess in cooking. Recently, it has been used to describe a certain “je ne said quoi” in all things.